Description: A famous hero in the world of Yanside, and the idol of many little girls and boys everywhere, including Artie. 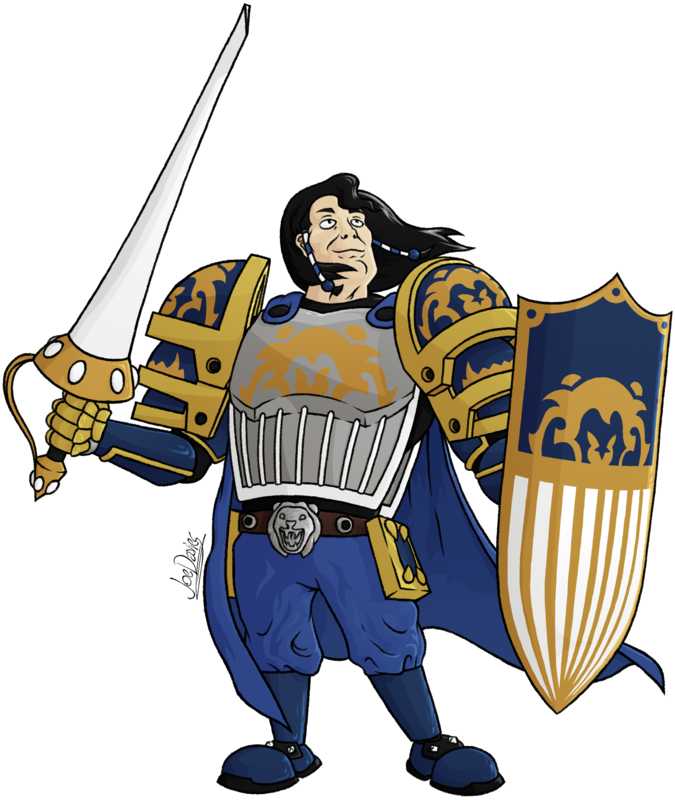 Leo is considered to be a celebrity in Yanside for his amazing exploits and adventures that landed him a position as knight captain of a certain kingdom. As such, he is very narcissistic and show-offy, flexing at any and every opportunity and loves to put his autograph on anything. If you don’t know his name, he wants to make sure you do by demonstrating his attack positions or giving you a piece of his merchandise. Speaking of which, he advertises them most of the time. His biggest-selling series of merchandise is a comic series that demonstrates his “wide variety” of talents and entails his many adventures. Kids buy the comics and idolise him like mad. Although strangely enough, even though in his comics there are a good amount of characters he rescues, in reality, people haven’t actually seen him do the stunts or amazing deeds that he proclaims. Rather than prove it, Armstrong simply gives excuses like “Yes, it was so awesome, you couldn’t comprehend it, which is why you don’t know about it.” or “You shouldn’t have blinked then, it was over in a flash!” Some people don’t buy it, especially his subordinates, but most that buy the merchandise and the kids especially like to believe his stories are true. One good reason for doubt about his exploits is that the unique monsters that he has faced have never been documented, seen, or even mentioned before. His retorts are usually that the creatures he fights are extremely endangered species and that they were undiscovered. And he tries to avoid scorn from archaeologists by saying that they were also incredibly dangerous, aggressive, poisonous, etc. So what is Leo Armstrong like in reality? Not many people know. If there’s one thing Armstrong has a true talent for, it’s pulling off the image he so boldly proclaims. His trademark equipment is his long thin shield and a certain weapon that can best be described as a mixture between a rapier and a lance. “Best for jousting, and best for swinging! All in one!”, he likes to comment about it. – A good part of inspiration towards his design came from Mel Gibson’s character from the movie; Braveheart.